Questions to the "Pine Guy"
1:00 pm to 5:00 pm. Click HERE for details.. 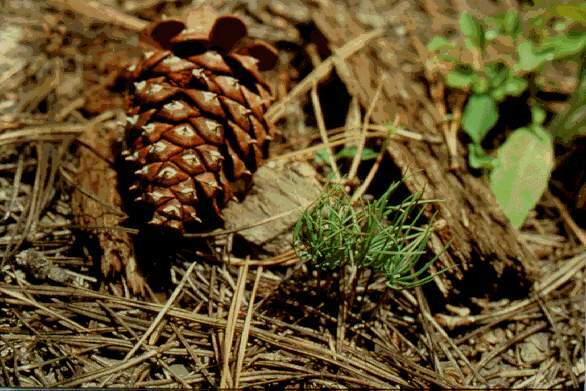 Titled the “Ponderosa Pine Legacy Project”, the program was developed by the Association’s Executive Committee in response to an on-going number of requests from schools and other groups for pine seedlings to establish small scale plantings, and for information on how to plant and grow ponderosa pine. The Association will make available each year a limited number of pine seedlings and will help in locating the needed technical assistance needed to be successful establishing this important native forest species. The Legacy Program is available to schools and other non-profit organizations. Click here to download requirements to qualify for legacy projects and an application form to help format an application. .
Our good friend and ponderosa pine enthusiast Lee Downing was killed last November in a woodcutting accident. Lee was a third-generation rancher and pillar of the Marcola Community. He hosted our 2008 summer tour and shared his success in establishing ponderosa pine in riparian areas. His techniques were enlightening but his persistence and enthusiastic management style impressed us all. Native Stand Mapping Willamette Valley Ponderosa a Unique Variety? Photo by OSU Extension. Ponderosa pine cone and new germinate. The Willamette Valley Ponderosa Pine Program was formally established in April of 1994. This group of pioneer ponderosa pine enthusiasts identified several needs regarding the Willamette Valley strain of ponderosa pine but determined that they fell into two categories. These were gene conservation and seed production/genetic activities that will lead to new pine plantations. The new group moved forward with seed collection, genetics testing, insect research, growth and yield data collection, brochure development and parent tree selection. The major participants and Cascade Pacific RC & D provided early funding. As the program matured the name was modified to the Willamette Valley Ponderosa Pine Conservation Association to better reflect the objectives of the group. Bylaws were formulated and formal agreements were developed with the Oregon Department of Forestry and Western Forestry and Conservation Association. The Association seeks to conserve and reestablish the native strain of Willamette Valley ponderosa pine for both genetic conservation and future timber, wildlife and urban uses. The potential to grow ponderosa pine on soils marginal for other tree species is significant. By planting pine, farmers and other landowners can realize substantial economic and ecological benefits. Thousands of potential planting sites exist within the Willamette Valley. In many areas, pine plantations can coexist well with livestock grazing or other rural land uses. Ponderosa pine's deep root system and stately form also make it an attractive choice for city parks, urban areas and watershed plantings. Conserve Willamette Valley Ponderosa Pine as a genetic resource. Maintain genetic diversity and adaptability of seed sources used in reforestation, wildlife habitat, and urban tree planting programs. Improve the genetic quality of Willamette Valley ponderosa pine through careful tree selection and prescriptive seed deployment. Locate and map native Willamette Valley ponderosa pine stands for future genetic collections. Locate and map plantations of ponderosa pine from known Willamette Valley parent trees and seed sources. Provide supplies of high quality seed for planting programs until seed orchards begin production (next 10 years). Provide for long-term supplies of high quality seed through development of a seed orchard. Promote applied research into growing and managing ponderosa pine in the Willamette Valley. Topics may include density management, pruning, suitability to various soil types, and pest management. Networking information among Willamette Valley ponderosa pine growers and researchers. Disseminate information to interested parties and the general public via newsletters, publications, tours, meetings, news releases and other means.